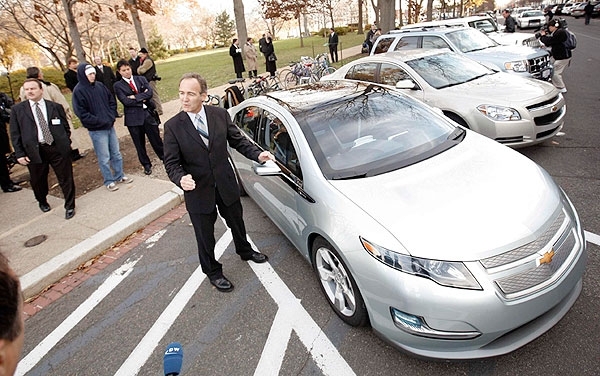 Larry Burns, General Motors' vice president of R&D and planning, talks to reporters in front of a Chevrolet Volt on Capitol Hill in Washington Thursday, Dec. 4. The top executives of the major U.S. auto companies pledged to refocus on higher fuel efficiency and lower production costs as they asked Congress for billions of dollars in emergency loans. 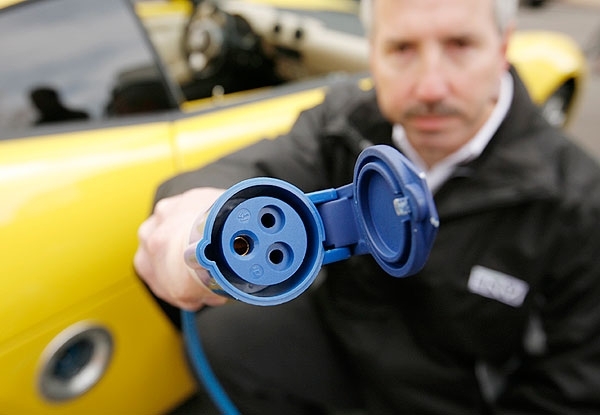 Lou Rhodes, vice president of Advance Vehicle Engineering at Chrysler LLC, poses with an electric Dodge EV on Capitol Hill in Washington Thursday. 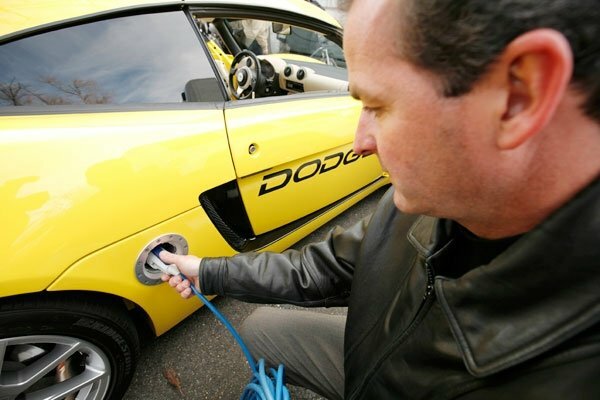 Bill Bagozzi of QEK, a company that handles the logistics of Chrysler showcars, demonstrates an electric Dodge EV on Capitol Hill Thursday. 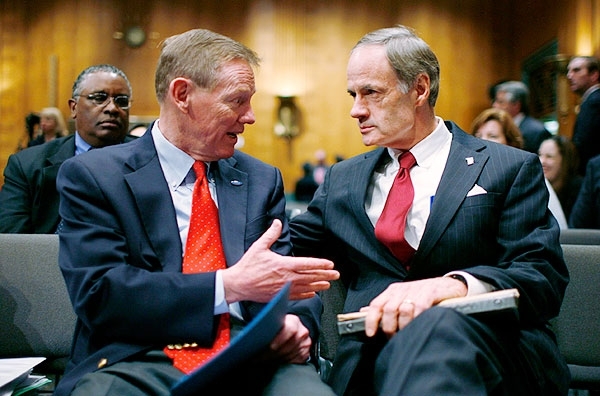 Ford Motor Co President and CEO Alan Mulally, left, talks to Senator Tom Carper, D-Del., before the U.S. Senate Banking, Housing and Urban Affairs Committee hearing Thursday. 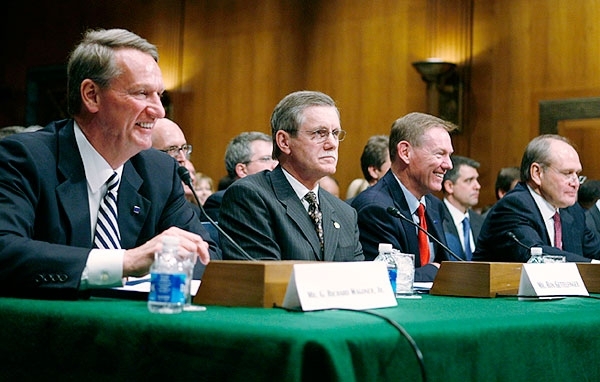 RIGHT TO LEFT: GM Chairman and CEO Richard Wagoner, United Auto Workers President Ron Gettelfinger, Ford Motor Co. President and CEO Alan Mulally, and Chyrsler LLC Chairman and CEO Robert Nardelli of take their seats before the U.S. Senate Banking, Housing and Urban Affairs Committee hearing Thursday. 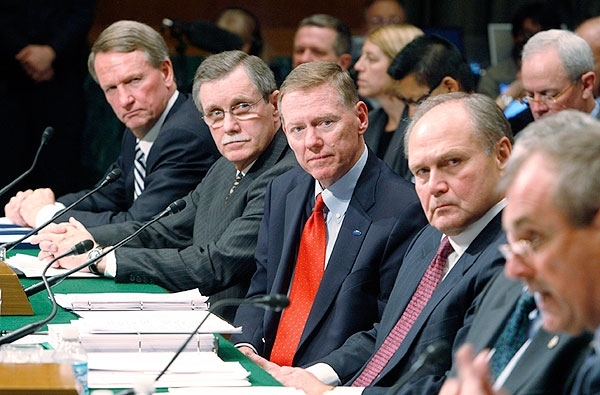 LEFT TO RIGHT: Richard Wagoner, chairman and CEO of General Motors, Ron Gettelfinger, President of the United Auto Workers International Union, Alan Mulally, president and CEO of Ford Motor Co., and Robert Nardelli, chairman and CEO of Chrysler LLC, listen to the testimony of Keith Wandell, right, president of Johnson Controls, Inc., during the U.S. Senate Banking, Housing and Urban Affairs Committee hearing Thursday. 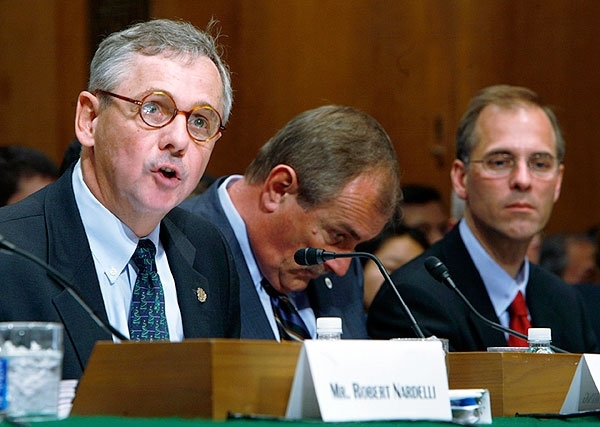 James Fleming, left, president of the Connecticut Automotive Retailers Association, testifies next to Keith Wandell, president of Johnson Controls, Inc., and Mark Zandi, right, chief economist and cofounder of Moody's Economy.com during the U.S. Senate Banking, Housing and Urban Affairs Committee hearing Thursday. 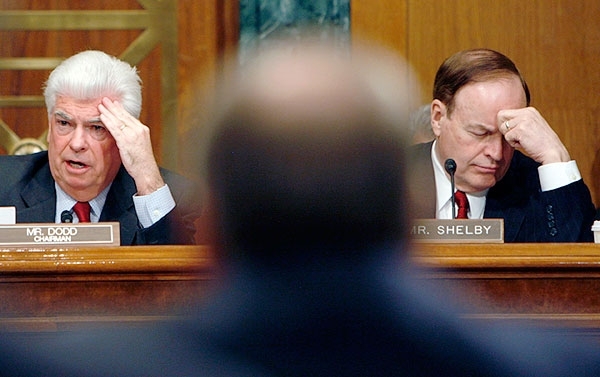 Sen. Christopher Dodd, D-Conn., left, chairman of the U.S. Senate Banking Committee, and Sen. Richard Shelby, R-Ala., listen to testimony from the leaders of the Detroit 3 during hearing on a financial assistance package for the companies on Capitol Hill in Washington. 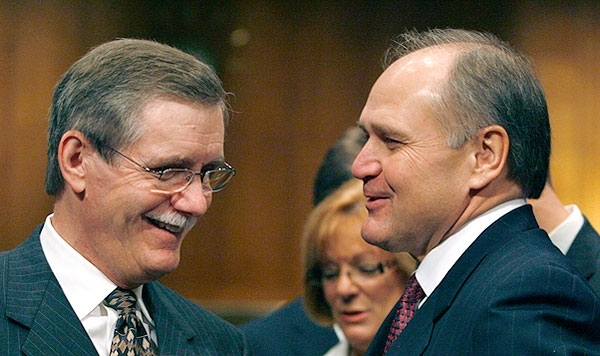 Richard Wagoner, left, CEO and chairman of General Motors, speaks with Ron Gettelfinger, UAW President, before testifying at the U.S. Senate Banking Committee hearing Thursday. 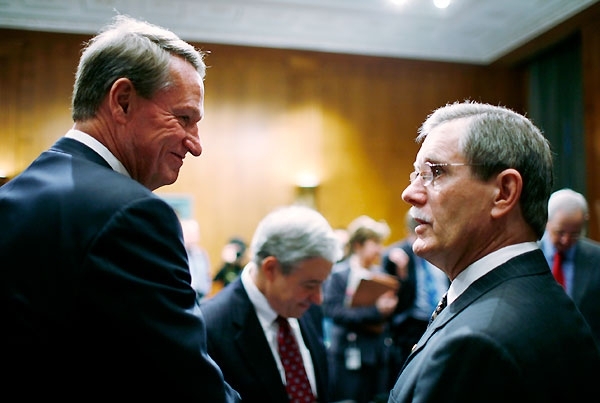 UAW President Ron Gettelfinger, left, and Robert Nardelli, chairman and CEO of Chyrsler LLC, talk before testifying before the U.S. Senate Banking Committee hearing Thursday.